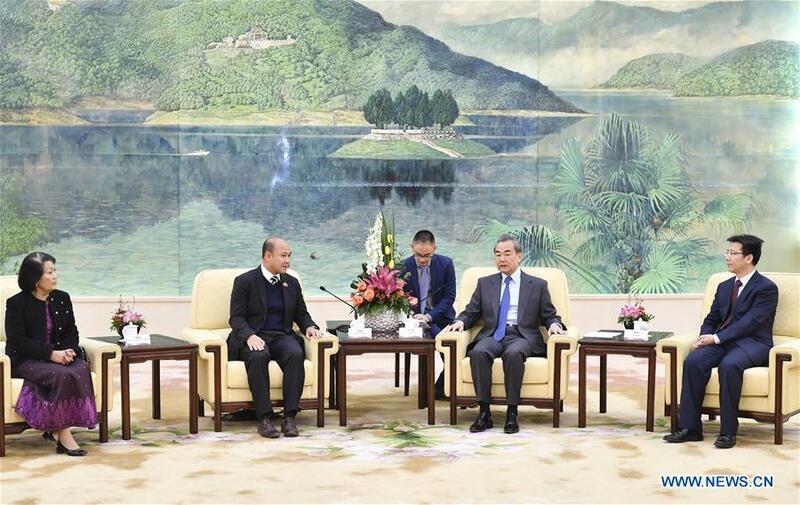 BEIJING, Dec. 6 (Xinhua) -- Chinese State Councilor and Foreign Minister Wang Yi met with Hun Many, president of the Union of Youth Federations of Cambodia on Thursday, pledging to strengthen exchanges and cooperation on youth. Wang spoke highly of the friendship between China and Cambodia over the past six decades since the establishment of diplomatic ties. Noting that China supports Cambodia in safeguarding national sovereignty and independence, and choosing the development path suited to itself, Wang expressed China's appreciation for Cambodia's support on issues concerning China's core interests. Wang also said he hoped young people from both countries would continue the China-Cambodia friendship. "As the young generation of Cambodia, we will continue the Cambodian-Chinese friendship and strengthen the exchange and cooperation between the two countries' youths," Hun Many said.